Download "Shannon L. David. Curriculum Vitae"
4 S. David Intercollegiate Athletics Ohio University, Athens, Ohio Graduate Assistant Athletic Trainer Primary responsibility Intercollegiate Athletics Division I Field Hockey coverage. Additional responsibilities included assisting with cheerleading, baseball, and men s basketball Carolina Medical Center Sports Medicine, Charlotte, North Carolina Special Events Athletic Trainer Per Diem athletic training coverage of camps and high school soccer and lacrosse University of North Carolina at Charlotte, Charlotte, North Carolina Athletic Trainer Primary responsibility included coverage of Division I softball Heidelberg College, Tiffin, Ohio Teaching Assistant Responsibilities included prep for labs, proctoring of exams, and grading. BIO363: Human Anatomy and Physiology BIO110: Zoology BIO209: Botany B. Workshops and Training 2012 Cleveland Clinic Sports Health Symposium: The Spine. Beachwood, Ohio Introduction to the Physician Extender: Casting Workshop National Athletic Trainers Association Conference Philadelphia PA. III. RESEARCH: PUBLICATIONS A. Manuscripts (Peer Reviewed) Farnsworth, J., McElhiney, D., David, S. L., Sinha, G., &. Ragan, B. G. (in press). Objective functional assessment following a head injury using movement and activity in physical Space (MAPS) scores. 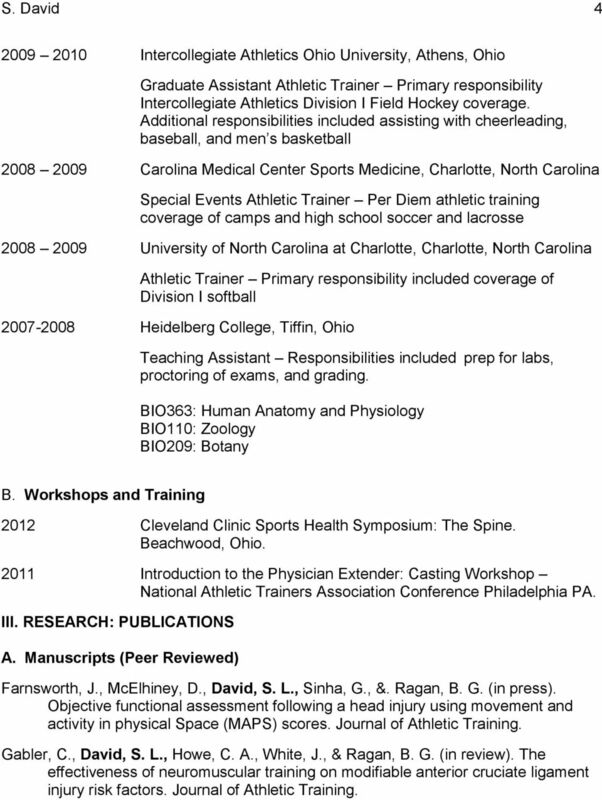 Journal of Athletic Training. Gabler, C., David, S. L., Howe, C. A., White, J., & Ragan, B. G. (in review). The effectiveness of neuromuscular training on modifiable anterior cruciate ligament injury risk factors. Journal of Athletic Training. 6 S. David 6 Annual Meeting, St. Louis, Missouri. Journal of Athletic Training Supplement,47, (S-192):210S-213S. B. 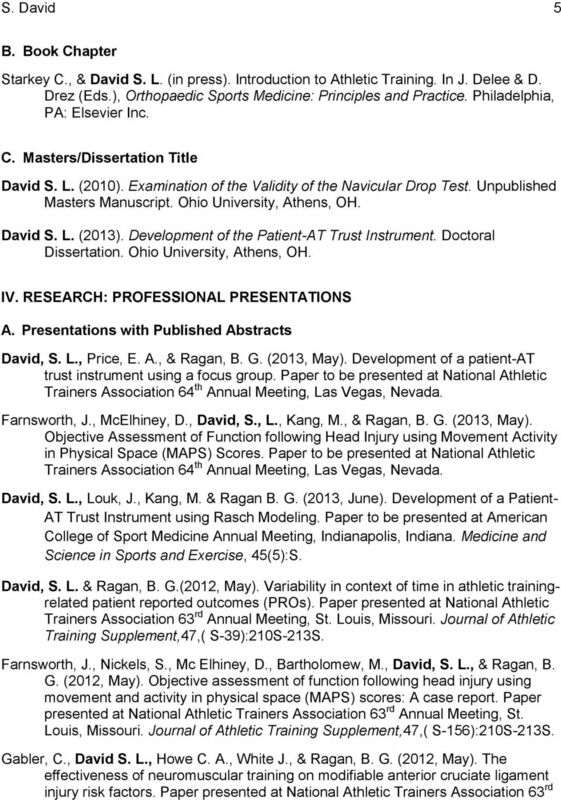 Presentations with no published Abstracts David, S. L. & McElhiney D. (2013, November). The Demonstration of Item Response Theory with Polytomous Items Paper presented at Mid-Western Educational Research Association Annual Meeting, Evanston, Illinois. David, S. L., Silva, K., Friebel, C. & Ragan, B. (2013, June). 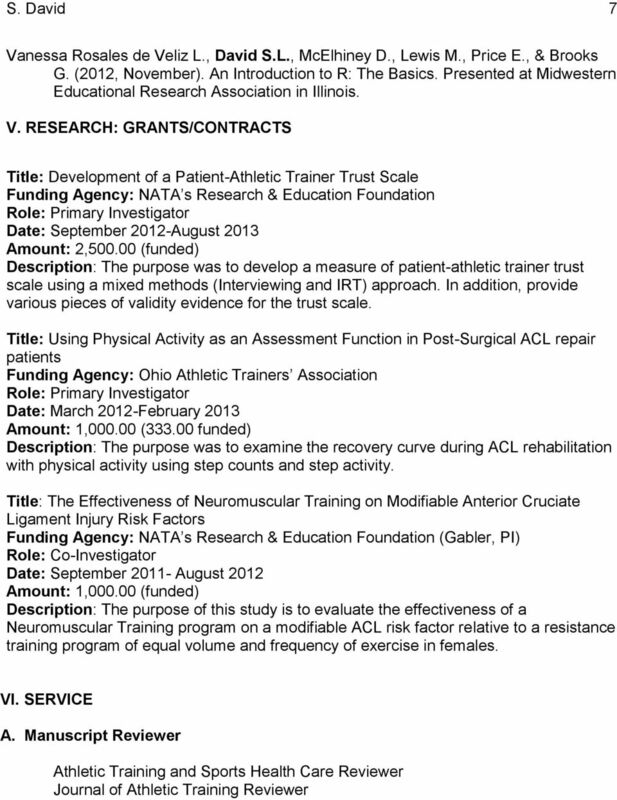 Using Physical Activity as an Assessment of Function in Post-Surgical ACL Repair Patients. Paper presented at Ohio Athletic Trainers Association, Columbus, Ohio. David, S. L. & Price, E. A. (2012, November). The use of mixed methods principles incorporating item response theory: An alternative item development perspective. Paper presented at Mid-Western Educational Research Association Annual Meeting, Evanston, Illinois. David, S. L., Starkey, C., & Ragan, B. G. (2010, May). Examination of the validity of the navicular drop test. 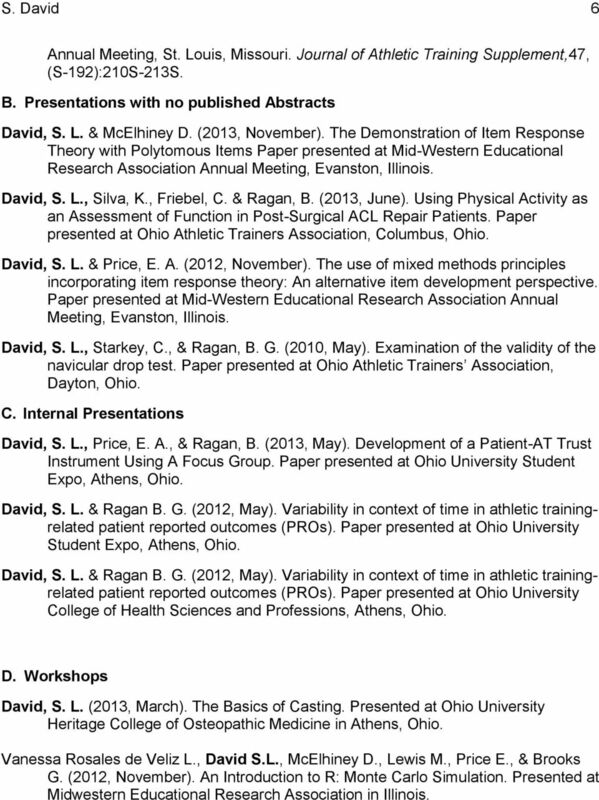 Paper presented at Ohio Athletic Trainers Association, Dayton, Ohio. C. Internal Presentations David, S. L., Price, E. A., & Ragan, B. (2013, May). Development of a Patient-AT Trust Instrument Using A Focus Group. Paper presented at Ohio University Student Expo, Athens, Ohio. David, S. L. & Ragan B. G. (2012, May). Variability in context of time in athletic trainingrelated patient reported outcomes (PROs). Paper presented at Ohio University Student Expo, Athens, Ohio. David, S. L. & Ragan B. G. (2012, May). Variability in context of time in athletic trainingrelated patient reported outcomes (PROs). Paper presented at Ohio University College of Health Sciences and Professions, Athens, Ohio. D. Workshops David, S. L. (2013, March). The Basics of Casting. Presented at Ohio University Heritage College of Osteopathic Medicine in Athens, Ohio. Vanessa Rosales de Veliz L., David S.L., McElhiney D., Lewis M., Price E., & Brooks G. (2012, November). An Introduction to R: Monte Carlo Simulation. Presented at Midwestern Educational Research Association in Illinois. 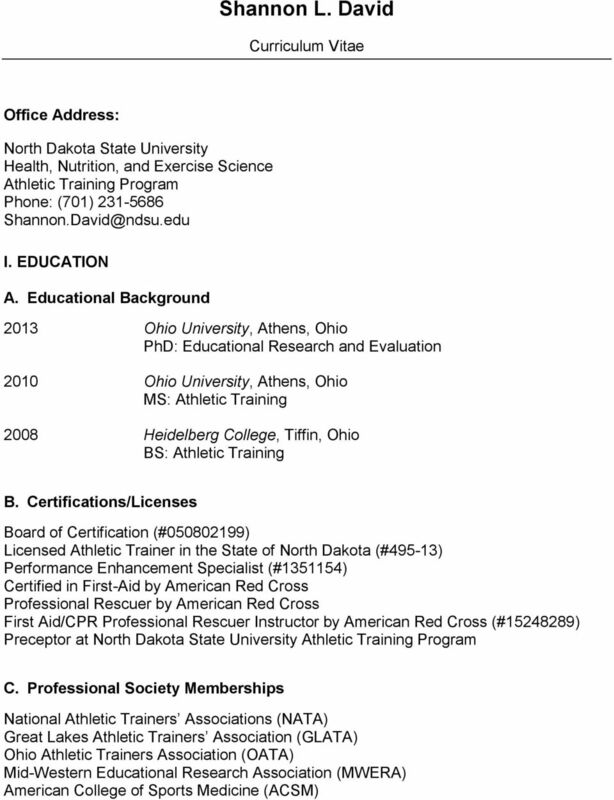 8 S. David 8 B. Abstract/Grant Reviewer American Alliance for Health, Physical Education, Recreation and Dance Grant Reviewer Ohio Athletic Trainers Association Research Committee ( ) C. University, Department, Program Committees/Organizations 2013 Self-Study Committee Member: CAATE accreditation Site Visit, North Dakota State University, Fargo, North Dakota Thesis Committee Member: Silva, K. (2013). Validation of Physical Activity and the Movement and Activity in Physical Space (MAPS) Score as a functional outcome measure following ACL reconstruction surgery. MS. Ohio University, Athens, Ohio Thesis Committee Member: Gray, K. (2013). 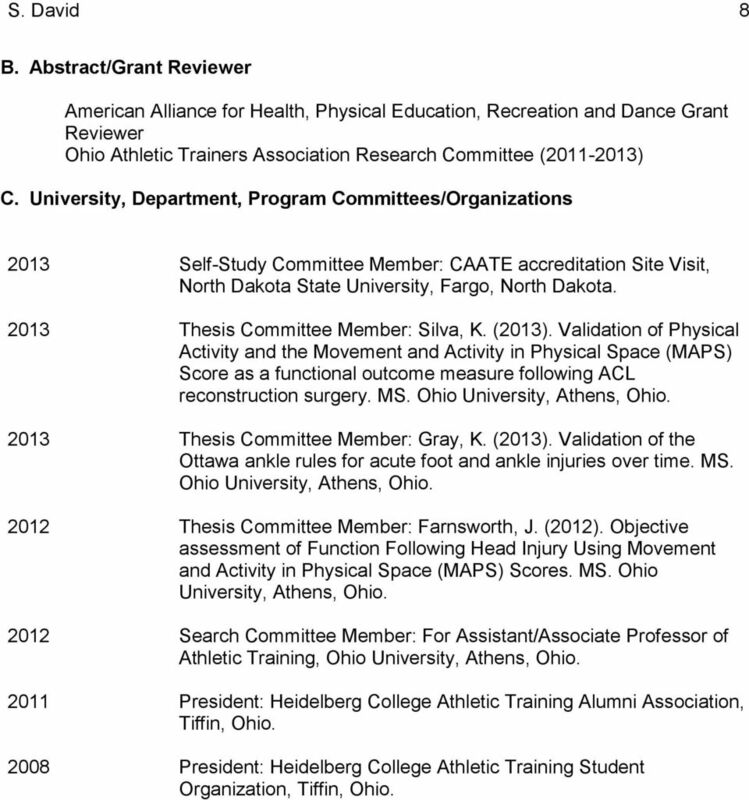 Validation of the Ottawa ankle rules for acute foot and ankle injuries over time. MS. Ohio University, Athens, Ohio Thesis Committee Member: Farnsworth, J. (2012). Objective assessment of Function Following Head Injury Using Movement and Activity in Physical Space (MAPS) Scores. 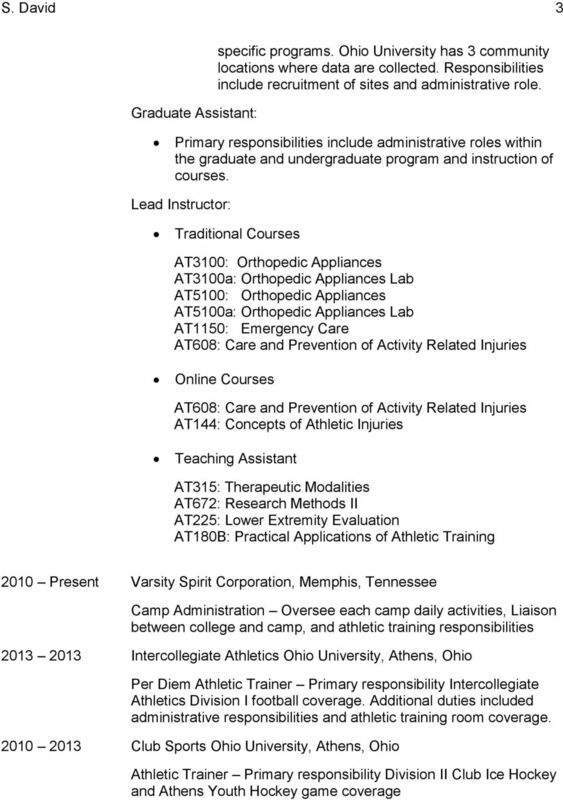 MS. Ohio University, Athens, Ohio Search Committee Member: For Assistant/Associate Professor of Athletic Training, Ohio University, Athens, Ohio President: Heidelberg College Athletic Training Alumni Association, Tiffin, Ohio President: Heidelberg College Athletic Training Student Organization, Tiffin, Ohio. 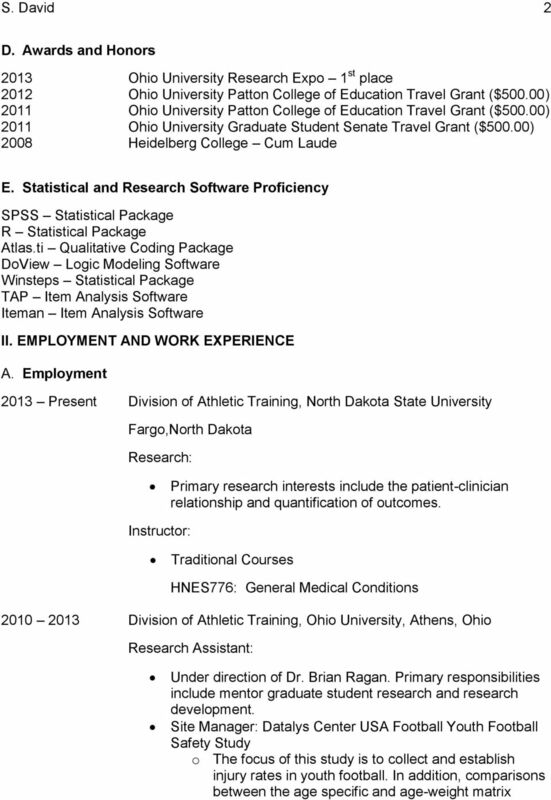 CURRICULUM VITAE Ian S. Rice, M.D. Dr. Khaled E. Ayad Alrehab City, Cairo Egypt Cell phone: 002 0100 617 3954 khaled-ayad@hotmail.com Education Doctor of Philosophy (physical therapy) Cairo University Cairo, Egypt, Jan 2006 Title of Ph.D.
Keith M. Rezin, M D 1 0 5 1 W U S R T. 6 1 M O R R I S, I L L I N O I S 6 0 4 5 0 1 W W W. R E Z I N O R T H O. C O M Profile Dr. Rezin is the founder and president of Rezin Orthopedics and Sports Medicine. Julia R. Bruene MD Midwest Orthopaedics at RUSH 1611 W. Harrison St., Suite 300 Chicago, IL 60612 (312)432-2436 www.rushortho.com EDUCATION M.D. Rush Medical College of Rush University, Chicago, IL. 2006-2010.